Functions are first loaded as [[String]] from a file via [[preprocessFile]] or [[loadFile]]. They are then executed via the [[call]] or [[spawn]] command. Since Armed Assault the loaded [[String]] needs to be [[compile|compiled]] in order to convert it to [[Code]], which is requried for [[call]] or [[spawn]]. Functions are first loaded as [[String]] from a file via [[preprocessFile]] or [[loadFile]]. They are then executed via the [[call]] or [[spawn]] command. Since Armed Assault the loaded [[String]] needs to be [[compile|compiled]] in order to convert it to [[Code]], which is required for [[call]] or [[spawn]]. A function is a piece of code which performs a specific task and is relatively indepent of the remaining code. They often accept input parameters and sometimes return values back to the script that called them. Functions were first introduced in the OFP: Resistance patch. Functions should be used for any processes where the result or calculation done in the function is important. This result or calculation should be made in the least time possible. They are unlike scripts, where timing is important. Functions are strictly limited to SQF syntax. While loops used in SQS scripts (or in functions called by them) have a limitation of 10,000 loops before they are forced to exit by the game engine in order to maintain some level of stability. However, this limitation can be overcome using a 'for' loop. The last expression given in a function is returned to the calling instance. Note that there must not be a semicolon after this value. 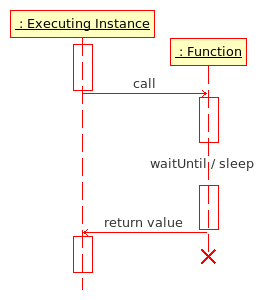 Notice that there are no brackets around the functions arguments which precede the call command.